We hear it at writing conferences, we read it in periodicals for writers, but often we don't pay attention. "Write for periodicals," we hear. "Get practice. Get name recognition. And, most of all, provide an opportunity to tell others the message you've been given." But we keep returning to writing our books: novels, novellas, non-fiction works. That's where the glamour is. We want to see our names on a book jacket. We aspire to be "published authors." I started paying attention to this advice shortly after attending my first Christian Writers' Conference. I began submitting meditations to The Upper Room devotional guide. Since then, I've been fortunate enough to have two of my submissions published. They put issues together a year in advance, and a number of my other meditations have been accepted and are awaiting publication. This week I got a great piece of news. One of my submissions will appear as the Good Friday meditation in the March-April 2008 issue of Upper Room. Is that such a big deal? Certainly the $25 fee I'll receive isn't much, although I have to admit that it was a thrill to get that first check. But these figures are impressive. Upper Room is published in 78 editions, comprising 41 languages in addition to English,going to over 100 countries. Each day about 3 million people read Upper Room. So, yes, it is a big deal. Check out the link above, go to the writers' guidelines, then see if you can put something God has laid on your heart into 250 words. It's a great ministry opportunity. I've been getting writing help from a writer of children's books. And it helps! Go figure. Thank you, Christine Tangvald. The person passing on those tips is my wife, Kay. I've said before that Kay is both my biggest fan and my severest critic. I don't mean that she says bad things about my writing (although I realize that some critics feel that is their mission in life). I mean that she reads my work with a critical eye, then asks some penetrating questions that always lead me to make what I've written better. Kay is interested in writing children's books, and so has taken some courses at the Mount Hermon conference under Christine Tangvald. Lest you think that children's books are easy to write--after all, they're short and the readers aren't exactly post-graduate students--I've learned that Christine prays and agonizes over every individual word of each of her books. Even more important is a bit of advice Kay picked up from her, the advice that Kay gives me when I'm stuck. You have to decide what your theme is before you begin writing. The theme--the central message--in one word! Try that one for size. In our walks on the beach each morning this week, I've poured out my frustration at not being able to make my current novel gel. And Kay would ask me: "What is your theme?" So I'd give her a one sentence "hook," guaranteed to make an editor's ears prick up. "But what's the theme?" Then I'd give her four more sentences. After several rounds of this, I finally came up with one word: "commitment." "There's your theme," she said. "Now, find a Scripture that captures how you want to show it." And it works. All at once, I'm thinking, "If I change this a bit, and put that there, and show how the protagonist is feeling about what's happened...."
It's a tough task for me, finding a one-word theme. Maybe all you novelists out there do it already. If so, good for you. If not, try it. I think you'll find it helps. Thank you, Christine. And thanks, Kay. I'm writing this while listening to the Maui surf roll. Kay and I are enjoying some time for relaxation here on our favorite island in Hawaii. 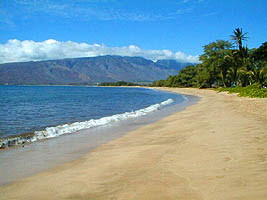 The condo unit to which we've chosen to return year after year is located in one of the quieter areas of the island (Sugar Beach, at Kihei). We enjoy each other's company, walk on the beach, eat seafood caught fresh that morning, and always come back refreshed. I've had a history of writing-related breakthroughs while on Maui. It was here that I retrieved an answering machine message from an editor who wanted to discuss my first novel. Even though it never made it past the pub board, it was an affirming time. It was while here that I learned that Kregel was offering me a contract for my non-fiction book, The Tender Scar. On this trip, I received an email from my agent, Janet Benrey, who had read the manuscript of my second novel and had suggestions for more work to make it better. (Thanks, Janet). While walking the beach this morning, Kay and I talked for almost an hour on how I could make those changes. I hope that by the time we make it back to Duncanville, I'll have some fresh ideas fleshed out and ready to execute. I'm thankful for this opportunity to get away for a time of meditation and renewal. I hope the results will be evident when I begin applying what the Lord is giving me on those quiet walks. Like the rest of the country, I watched with horror the story of the killing of thirty-two people at Virginia Tech. Today, my prayers go out to every family affected by this senseless tragedy. I'll readily admit it: it's been too many years since Mrs. Billie Casey tried to instill the rules of punctuation into me in the hallowed halls of Decatur High School. Oh, I know when to insert periods and question marks. I realize that exclamation points should be used sparingly. I'm pretty good at putting quotation marks where they below. Then again, there's the comma. When Dr. Dennis Hensley, that stern taskmaster who teaches writing at Taylor University, did line-editing on some of my work, he threw out so many commas that I considered selling the excess on eBay. My rule of thumb on commas, other than using them to set off parenthetical expressions such as this one, or to separate several words in a series, was to insert them in a compound sentence at the point where I'd normally pause for breath--whether the clause that followed was independent or subordinate. That ended when Dennis "got a-hold of me," as we'd say on the prairies of North Texas where I grew up. His red pencil sent me scurrying for my reference books. 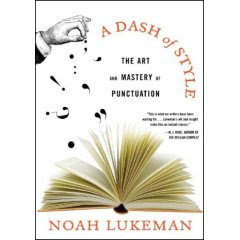 I have a number of them, and I read them all; but I'd never found a book on punctuation that I actually enjoyed reading--until this one came along. Noah Lukeman's A Dash Of Style. Lukeman is the author of a number of excellent books, probably the most well-known of which is The First Five Pages. He's an agent, and in his books he uses his experience to teach writers and would-be writers valuable lessons. I bought A Dash Of Style in hopes that it would make punctuation easier for me. It did, but the story doesn't end there. Lukeman discusses punctuation marks as they affect the sense of the sentence, the way it would sound when read. He talks about varying the pace of the writing through the use of commas, periods, semicolons, colons, dashes, and even the despised parenthesis. I can't begin to relate all the lessons of the book, nor would I even try. After all, as all authors know, it's best to give a taste of the book and hope that it sends the reader scurrying out to buy a copy. I recommend A Dash Of Style and would like to thank B.J. Hoff for listing it in her recommended books for authors. B.J., once again, I owe you. This week I’m happy to be able to post an interview with Brandilyn Collins. She’s one of the giants in the field of Christian fiction, and I’m privileged to call her my friend. Brandilyn’s new book, Coral Moon, has just been released, and we’re all looking forward to seeing how she’s going to keep us on the edge of our chairs this time. I’ve just started reading the book and I’m already hooked (and about to start sleeping with the lights on). Let’s find out more. RM: Among all the mysteries you’ve written, what’s the most unique or exciting thing about Coral Moon? BC: Okay, here’s the secret. It’s my ghost book. First time I’ve ever gone there. Didn’t know I ever would, even when I sat down to write this story. God apparently had His own plans. It happened in the strangest of ways. I needed a real twist hook for a certain chapter about 50-60 pages into the story. So out popped something about ghosts. I stared at the screen and said, “What in the heck am I gonna do with that?” And from there the book went on. I went back into the pages before that and made some necessary additions to lead to that twist. Remarkable, really, as I look back on the process. Because reading the finished book, you’d think—how could this story be written without the subject of ghosts? God took me totally where I didn’t expect to go, and He made it work. Now that it’s all said and done, I really like this book, and I think readers will too. It’s quite a story. But while I was writing it—man, this was a tough one. I just thought the thing was terrible. Now, you might ask, what’s the difference between Coral Moon as a ghost book and many other suspense novels that include ghosts? Coral Moon tackles the subject from a Christian perspective. And it doesn’t just take the presence of a ghost for granted. It asks questions. What are ghosts? Can they be real? What does the Bible have to say on the subject? This book is gonna lead to some very animated book group discussions, methinks. RM: When I once teased you about non-fiction vs. fiction, you reminded me that you’ve been published in non-fiction. Actually, you told me your first published book was in that genre. What can you tell us about your non-fiction? BC: I was working on my first novel, Eyes of Elisha. To research all the trial scenes, I visited two trials in the Bay Area of California. Both were high-profile cases. The second was the so-called “Diary Girl” case, in which a teenage girl wrote in her diary that she’d killed her four-year-old sister, who had died two months previously during the night. I sat in the courtroom that first day, my antenna waving all over the place. Something did not jibe… I ended up with the exclusive story from the family and defendant, and wrote the book about the case. This was the famed Melvin Belli’s last big criminal case before his death. Talk about a story! I could not have written it as a novel—too unbelievable. So I put aside my novel, wrote this true crime, then went back to my fiction. Writing this true story taught me so much about the legal system and how murder trials go. I was able to use much of this in Eyes of Elisha. If you like true crime, you can try to get a copy of A Question of Innocence (published by Avon in 1995) through amazon.com and other online places that sell out-of-print books. It really is an amazing story. Even though it’s all true, I wrote it with fiction techniques as much as possible, so it tends to read like a novel. BC: Nope. I’m just naturally warped. RM: When you “get away,” do you still write? Do your fingers itch for your laptop, or are you thankful for the rest? BC: My fingers rarely itch for the keyboard, unless I’m deep into the crisis/climax. I’m very happy to “get away” when I can. But mostly those times come in bulk. July, for instance, is not a writing month due to family obligations, ICRS, and my Idaho writers’ retreat. I also take off a couple weeks around Christmas. RM: What advice do you have for the unpublished writer of Christian fiction? BC: Oh, my, lots of it. I can’t possibly put it all here. 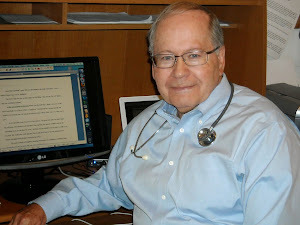 The best thing I can recommend is to read my blog, Forensics and Faith., because that’s where all the advice is sitting. The blog has a good-size archive on lessons in the craft. We also discuss what’s going on in the industry—marketing, bestseller lists, trends, controversies, etc. Best of all, the information is free, so be my guest and take advantage of it. Forensics and Faith exists for the encouragement, education, and entertainment of Christian novelists. BC: If you like Coral Moon (and of course, you will), tell the world what a terrific writer I am. If you don’t like it (which I can’t imagine)—tell the world Deb Raney wrote it. Thanks, Brandilyn. I hope everyone out there will check out Coral Moon. And we all hope that you heal rapidly and completely from that ankle fracture. I've enjoyed reading some of the blogs of my fellow authors as the Easter season progressed. Some made passing mention, some no mention at all, and a few gave a significant amount of space to the events of Holy Week. Now it's the day after Easter. True, it doesn't really produce the same letdown feeling that many of us experience after Christmas. (I love the way former Dallas Cowboys quarterback, Don Meredith, put it: "Ain't nothin' as over as Christmas.") But to many of us there is a bit of a feeling of anticlimax. I'm going to suggest that the proper attitude to adopt now is this. I'm going to begin the countdown to next Easter, remembering every day the significance of what we've just celebrated. 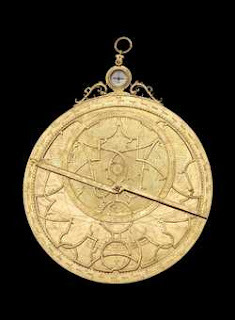 The instrument pictured here is an astrolabe: a wonderfully crafted work of art, an instrument that shows the alignment of stars and planets. It can be used as a form of calendar. As a matter of fact, on the back of this one is a carefully engraved calendar showing all the Christian holidays for the year. I'm not much on keeping track of St. Swithin's Day, but Easter is sort of special to me--especially since my first wife went to be with the Lord. I never tire of the Resurrection story. 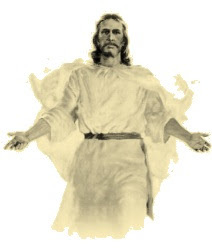 I gain hope from the promise of Christ to the thief crucified beside him: "This day you will be with me in Paradise." So, I've set my sights on next Easter. And until then, I plan to live each day as though God was watching. Because He is. 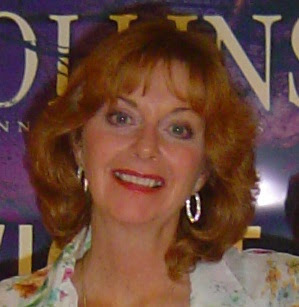 Note to my readers: Be sure to come back on Thursday, April 12, to see my interview with Brandilyn Collins. I don't guess this is an unusual subject for a retired otolaryngologist (okay, that's an ear, nose and throat specialist). But in this case, I'm not talking about your speaking voice. 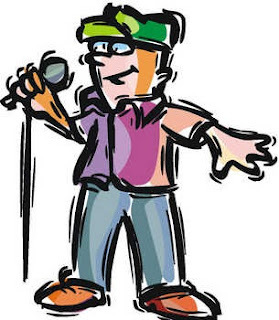 I'm talking about losing your writing voice. 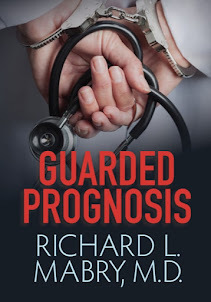 For quite a while I've been fiddling with a work-in-progress in the genre of suspense fiction. About a year ago I took the first part of it to the writers' conference at Mount Hermon. A critique group analyzed it and made a number of suggestions. 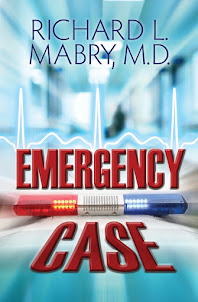 The group leader, a well-respected author in Christian fiction, sat down with my laptop and virtually rewrote the opening scene, pointing out areas where I could jack up the tension, heighten the suspense, etc. Since then, every time I'd read or hear something from an author or editor that I thought applied to that opening scene, I'd change it. Some of you may not understand this, but I think all you authors will. Recently I got up enough courage to send the first couple of pages to Ray Rhamey, an editor whose blog, "Flogging The Quill," offers "public floggings" for authors willing to submit their work for critique. Suffice it to say, Ray had lots of suggestions for improvement. But the most telling thing he wrote was that I appeared to have lost my "voice." The more I thought about it, the more I agreed with him. I'd been so enamored by all the suggestions that what I now had was a mish-mash of everyone else's ideas. I've rewritten the first couple of pages, and Ray may even print them and further critique the work. That's not the important part, though. What's important is that I've learned not to try to be "all things to all men" with my writing. Truly, "I gotta be me." Critique groups are great for some people, not for others. Editors and other authors can make suggestions. But in the last analysis, the author's voice has to come through. I need to remind you all that in a week (April 12) I'll be posting an exclusive interview with Brandilyn Collins. You'll want to tune in for that. This is Maunday Thursday. We're in the midst of the holiest week of the Christian calendar. For you and yours, may I wish a blessed season and a most wonderful Resurrection Sunday. When you look at the picture, you'll probably think, "Is he still on baseball?" Well, yes and no. I'm talking today about arguing. Public arguing. More specifically, collegial back-biting and sniping. Just because a writer is a member of the "Christian writing" community doesn't mean he will have the same view on all aspects of writing as every one of his colleagues. On the contrary, we're all different, and that's what makes our writing unique. But it's not unreasonable to expect that, because of our Christian worldview, we'll be civil in our dealings with others. When that isn't the case, it's disappointing. When I first became involved in Christian writing, it didn't take me long to recognize the authors and editors whose opinion I valued and whose advice I wanted to seek out and take seriously. Toward this end I began checking out their blogs. Most of them published information that I found very helpful as I attempted to mature in my writing, and I looked forward to reading their postings. I suppose that my favorite site became the Charis Connection, with postings from a number of experienced and respected authors. But recently, I've found myself reaching for the antacid after reading some of the comments that were generated. It's tough to condense the answer to a difficult question or to address a thorny writing problem in just a few paragraphs. Add to this the inability of web posts to convey emotions (except for emoticons and the all-pervasive :) symbol, both of which I abhor), and it's easy enough to misconstrue remarks. If the reader is itching for a fight anyway, there is generally enough fuel there to get the fire started. And therein lies the problem. Recently it seems that a group of writers are itching to take umbrage at anything that might conceivably be interpreted as differing from their own opinion, intimating that the opinions of the Charis authors are casting aspersions at their own writing ability. I won't fan the flames of the most recent debate by taking a side, although I certainly have a strong opinion. Rather, I'd offer this bit of advice. I'm unpublished in fiction, so I think I can be reasonably objective. Sometimes it seems that published authors have it so easy, and it's tempting to take potshots at them. Well, rejection hurts. Writing, revising, submitting, getting your work sent back--it's part of the journey every writer faces, and it can frustrate you. Then the children get sick, unexpected bills come in, it rains every day for a week, and that just adds to your frustration. When I find myself feeling that way, I try to severely limit my web correspondence. Usually, in a day or two I'm better, and I can resume browsing my favorite sites without trying to start a fight with every post that picks at one of my scabs. And, if there's something that I feel needs to be said, I don't try to preach to somebody else's audience. I use my own blog. And that's just what I'm doing. And I waited a couple of days before doing it. Now go out there and write something. I'm praying that you succeed in the calling God has given you.